A Study Suggests That Active Learning >> Flipped Learning. Is it Asking all the Right Questions? This week The Journal published this article: Research: Active Learning More Important than Flipping the Classroom. The article is focused on a study titled, Improvements from a Flipped Classroom May Simply Be the Fruits of Active Learning, published in September, 2014 by three faculty members from Brigham Young University. This is certainly worth exploring further for those of us who are advocates of both flipped and active learning. It is encouraging to see methodical studies like these being conducted, and we look forward to the possibility of further findings as this methodology is applied to more course offerings and more students (this study compared two groups of 50+ students in the same course taught by the same professor, with only the methodology being altered). It is also encouraging to see the conclusion that active learning positively impacted engagement and learning outcomes in both groups on the study! Many of us who advocate for flipped instruction have frequently voiced our opinion that a key benefit of flipped instruction is that it make more class time available for Active and Constructivist Learning paradigms. This is a key thrust of Sams and Bergmann’s Flipped Learning: Gateway to Student Engagement. They focus on the question, “What is the best use of class time”?, and active learning certainly belongs in the dialogue when seeking to answer that query. A key reason that flipped teaching and learning marries so well with the active classroom is that by pushing some of the rote instructional practice outside of, and prior to, class sessions, it frees up valuable face-to-face class time for applied learning pursuits. Much has been written about the idea that being more engaged in your own learning and doing things like working in groups, getting hands-on, engaging in discussion, etc., provides a more productive learning experience than simply listening to a lecture for most of class. While I was comfortable with the report’s positive conclusions regarding Active and Constructivist Learning, I couldn’t help but notice that various perceived benefits of the flipped classroom did not appear to be explored in the study. Rewind, Reply, Review: There is little discussion of the impact of having learning materials available for repeated viewing. This is something that students in flipped classrooms often cite as a benefit of the model. Students Missing Classes: One of the key challenges that drove Sams and Bergmann to evolve this approach was the fact that busy students often missed classes due to sports or other obligations and therefore missed the lecture – in the context of the study, this means they would miss the ‘Engage’, ‘Explain’, and ‘Explore’ learning phases in the classroom. This study was conducted at a residential college, so perhaps the issue of missing classes just isn’t as prevalent as it is in other situations. Additionally, since Active Learning models can be effective at encouraging attendance (students seem to appreciate this engaging approach over routine lectures), maybe the class was so well attended that this wasn’t an angle worth considering. Nevertheless, this is a benefit of the model that cannot be overlooked when considering it on a larger level. Technical Subjects Where Application is the Most Challenging Part of Learning: At The College of Westchester, Dr. Christopher Nowsisi has flipped his Cisco Networking Basic course. There is a great of material to cover in this course, and students often struggle with applying this knowledge to labs that they must complete. This is a key reason Dr. Nwosisi has found flipped instruction to be quite beneficial. Students often need help completing the labs, in which they turn concepts into applied knowledge. Prior to flipping the course, students would often struggle at home to do the labs, but since implementing flipped learning, the labs are done in class and fewer students are ending up with D’s, F’s or Withdrawals. This idea applies to many technical courses and other subjects that require this sort of in-depth application of learned materials. Additionally, when courses are offered to busy non-traditional learners, often in faster paced term structures, the flipped instruction model helps to put time to better use. Those are just a few of the potential benefits of flipped teaching and learning that this particular study does not seem to incorporate in its analysis. Once good content is created (or found and put to use), it is not necessary to re-create it over and over (although it certainly needs to be refreshed from time to time), so it should be recognized that this is largely a “one time” cost, as opposed to an ongoing one. While it absolutely takes time to develop and prepare good content, it does not have to cost much, as there are so many excellent free tools available for doing so, and more great learning content is published very day. Using a tool like ed.ted.com to flip an expert YouTube video on a topic doesn’t cost a dime, and many teachers are willing to leverage the wealth of expert content available and “make it their own” by using tools like these. The move towards increased use of digital learning materials is a larger trend that brings many benefits with it and is more inevitable every day. In closing, this study and it’s findings strike me as indicative of the changing nature of teaching in today’s world. Both Active and Flipped Learning encourage teachers to evolve into more of a ‘guiding’ role and step away from the centuries-old role of being proprietors of knowledge. Like it or not, the Internet and the Web have placed a wealth of knowledge at the world’s fingertips, and the need for teachers to be knowledge warehouses is by no means as essential as it once was. The role of teaching is positioned for a significant step forward. The opportunity, and indeed the necessity, is upon us for teachers to focus on helping students learn how to learn, and to inspire them to take ownership of their lifelong learning journey. Today learners are overwhelmed by the bonanza of information at their disposal – they need help navigating it, assessing it, and applying it. This seems to me to be a higher calling than simply disseminating knowledge. 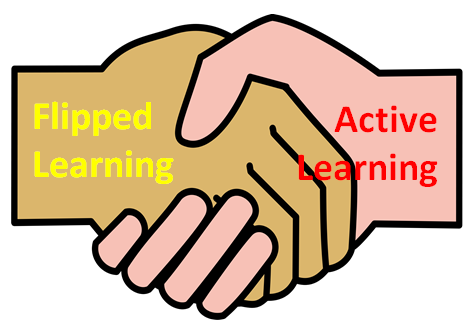 And as for the flip vs. active learning – I believe they work excellently together. Only time will tell if more robust studies such as the one conducted at Brigham Young will shed clearer light on the best ways to leverage them.